Q: Could you tell us about your childhood – your family, where you were born and where you grew up? A: I was born on 9 September 1925 and turned 91 last month. I was born the eldest in a family of six children, in Galle Fort during the Great Depression. My father was a wealthy bachelor who went bankrupt. Then the war followed. It was hard times with food and other essentials being rationed and sometimes even suffering the ignominy of not having a decent place to live. My mother’s strength and piety was what united our family and gave us courage. Our house was near the old lighthouse where a cannon had been installed. One day when they fired the cannon, one of the walls in the house cracked from top to bottom. The next morning the captain came and told my father that this would keep happening and advised us to shift. As a result, the family was splintered and I was sent to Kurunegala to live with relatives when I was 14. Q: What was life like in Kurunegala and what did you do there? A: I lived in Kurunegala for eight years, working as a clerk in the Food Department from around the age of 18, and I stayed with my uncle Shums Cassim, a leading supporter of the UNP. He had constant visitors to his place, like Sir John Kotelawala, R.G. Senanayake and other UNP stalwarts. On one occasion, RG asked me what I was doing. I said I had applied to Law College. He discouraged me saying there were enough lawyers and asked me to help him instead. So I moved to Koulwewa Estate in Narammala owned by D.S. Senanayake. It was election time and he gave me Rs. 30,000 telling me to use the money to supply food and fuel to party supporters. This was in 1952 and I had never even seen Rs. 3,000 let alone Rs. 30,000 before. I did what was expected and returned Rs. 17,000 to him and he was shocked. When RG was appointed Minister of Trade and Commerce, he asked me to be his official private secretary. It was a huge upgrade for me - a milestone in my life. To be a secretary to someone from the Senanayake clan – I could do anything I wanted. When the Minister had a disagreement with PM Kotelawala and wanted to resign, Mrs. F.R. Senanayake sent for me and said the auspicious time for him to resign was 7:30 a.m. I called Sir John Kotelawala and said the Minister wanted to come at that time to hand over his resignation. Sir John said, ‘Ask him to come and have some egg hoppers with me.’ We went there, enjoyed the egg hoppers and the Minister gave his resignation, at which point my appointment also ceased. This was an era of gentlemanly politics. A: Because I was so involved in the kitchen cabinet of that era, Sir John put his arm around me and asked what I was going to do since I was now without a job and suggested I look after his estates. I told him I knew nothing about estates. Shirley Corea was seated nearby waiting to take up his appointment as replacement for RG. He then told Corea, ‘Appoint Cassim as your Secretary.’ I took up the job but I realised that this job too depended on the Minister and would cease upon his resignation. The period with Shirley Corea was an experience I will never forget. I travelled and met world leaders and personalities and learnt the art of diplomacy. This came in use in dealing with the various presidents, PMs and government officials when developing WTC and HC. It was apparent to me that Ceylon was held in high esteem and there were high hopes for it. I remember Pandit Nehru telling Corea: ‘Ceylon is smaller than the state of Madras and it can be the showpiece of Asia. You have all the resources and intellectual base.’ We were lodged at Rashrapati Bhawan and a plane made available to us for tour. And Chinese Premier Chou En-Lai when he stated his willingness to trade with us said: ‘Minister, I only have to ask my people to forego one meal of rice and I can provide your entire nation for one year.’ We were his special guests at the celebrations in Tiananmen Square. But when Ceylon Shipping Lines advertised for someone to be sent to the UK to become conversant in shipping, I applied and of course with some influence I got the position. I was sent to the UK for three years but I had to cut short my stay due to family issues back home and came back. Living abroad with my new wife was an exhilarating period in my life – travel was then not what it is now and experiences such as ours far and few. On my return I was appointed as understudy to Paul Hanson from Oslo, Norway, who thereafter became a dear personal friend. After six months he told the Board that I could work without him and he recommended that I take over and he left. Our friendship remained unto his death and I visited him often in Norway. It is a relationship I value and cannot forget. Working for Ceylon Shipping Lines, I became the Shipping Manager handling all the shipping arrangements. I made good contacts and gained a lot of knowledge not just about shipping but the ways of the world. Q: You met S.P. Tao around this time? A: During this tenure, S.P. Tao was shipping rice from Burma to Sri Lanka and he fell in love with Sri Lanka. He had gone to the Food Department to make arrangements and had met B. Mahadeva and K. Aluwapillai, who had told him to ‘meet Cassim at Ceylon Shipping Lines’ and make arrangements. We got to know each other in 1957 and I gradually became very close to Tao. He was a regular invitee at my house for lunch and he would tell me in later years that he had never tasted Sri Lankan food as good as the food my wife cooked for him. S.P. 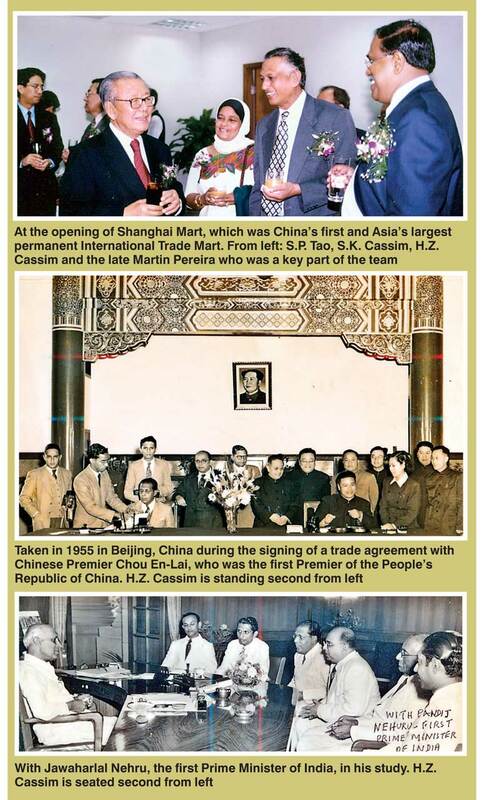 Tao was involved in developing the Ceylon Shipping Corporation and he had a 25% stake in it. When the Government changed to that of Sirimavo Bandaranaike, N.M. Perera who was the Finance Minister told Tao that he had no place in a socialist set up and so he parted with his 25% stake. He continued to transport rice from Burma however but things had changed due to the changed political ideology. I was keen to start my own company and felt I had sufficient knowledge, experience and contacts to do so. Despite tremendous pressure not to resign from Ceylon Shipping Lines, I approached Tao and asked him to help me. My immediate purchase was a coconut estate in Giriulla to buffer any fallout from my primary venture which was the investment in HZ Cassim & Co. I had a family of three children by then and I needed to ensure that they would be comfortable. In a short time however, HZ Cassim & Co. became a very large shipping agent recognised in the shipping fraternity and I was able to return the loan to Tao. I went into the business of deep sea trawler fishing with local partners as well – a first in Sri Lanka. I even tried my hand at paddy and chillie cultivation in Elahara and Polonnaruwa. When it was announced that the first 10 income taxpayers would get a permit to import a car (for which I qualified), I proudly imported a Mercedes Benz and I was on top of the world. This too was a milestone in my life when I remembered the days of hardship in Galle Fort and now I was able to help my family. It was a validation of the trials and effort that was required to get to this point in my life. I was respected not just in the business community and shipping fraternity but also in my own community. Even after I finally sold HZ Cassim & Co, with all the goodwill attached to it people continued to associate me with the company and not just because I was its namesake. This came to be significantly important when I returned to develop the WTC. Q: What made you leave Sri Lanka? A: I was involved in UNP politics from a very young age and as a result, during the 1970 elections, I was witch-hunted. I lost everything. My estate, my business, my staff whom they took to Shipping Corporation – I was left with practically nothing. Tao suggested I move to Singapore or London. I moved to Singapore albeit like a refugee but with Tao’s gracious willingness to support my move. I lived in Singapore for over 20 years, working mainly with Tao at Shing Kwan Investments Ltd. In 1971 when Tao advised me to relocate to Singapore, Sri Lanka was a good place to live and a country that was coming up and respected. In fact when the aircraft carrying my wife and son was hijacked by the PLO in 1970, all it took was a call from PM Sirimavo Bandaranaike to Yasser Arafat and they were released instantly. I remember my wife crying after we moved to Singapore, calling it a ‘hellhole’; it was in such a bad state. That Singapore has developed to what it is today within such a short space of time is credit to the vision of a man I admire greatly – Lee Kuan Yew. I watched with wonder and followed his every step. My library at home is stocked with books of him. Sri Lanka is dreaming when we say we want to be like Singapore. A: I returned to Sri Lanka in 1991. By that time my wife had passed away and I felt the need for family and friends – the large community I moved with in Sri Lanka. We had a very good life in Singapore but one by one our peer group passed on. This was one reason that made it easy for me to return when we decided to develop the World Trade Centre. Q: What was your involvement in the WTC project? A: In 1990, President Premadasa sent Paskaralingam to Singapore to ask Tao to come and help develop Sri Lanka. Despite being in the midst of the LTTE problem, Tao took this bold decision to build the World Trade Centre. I was his back-up and we faced all the hurdles together. Tao once told me, ‘I would not have come to Sri Lanka without you.’ Against incredible odds we developed the WTC, which up to now is the preferred location for offices in Sri Lanka. Tao’s incredible foresight ensured that. Shing Kwan took over Overseas Realty Ceylon Ltd. from the previous Chinese owners who had gone bankrupt. We started with just two other staff. ORCL became a Board of Investment flagship company with the largest private investment. We hired a foreign contractor and formulated an excellent team and completed the building, which was officially opened on 12 October 1997 by President Chandrika Kumaratunga. Three days later, on 15 October 1997, the LTTE attacked it. They placed a bomb laden truck at the Galadari car park close to the WTC. Luckily for us, the contractors had placed iron girders right around the perimeter, so when the bombs exploded, the girders shook but major damage was limited to only three floors. I went immediately to the WTC amidst ongoing gunfire and was devastated to see the callous damage to our hard work. President Kumaratunga called me and I went to meet her with B.C. Perera and Thilan Wijesinghe. She said she wanted the WTC restored. This was understandable as it was an icon of hope to a country drowning in a protracted civil war. I told her that we just didn’t have the funds. She without hesitation said she would provide the funds from the Government Insurance. We were lent the necessary funds to rebuild and the WTC was restored to its pristine condition without much delay. Q: After its WTC success, Overseas Realty then took on the massive Havelock City project. How did that come about? A: In 2002 I met PM Ranil Wickremesinghe and while in discussion, he mentioned he was going to London and I arranged for him to meet Tao, who was also in London at the time. Over dinner at Arlington Club, Ranil asked Tao to take over the Wellawatte Spinning and Weaving Mills, for which the Government had been trying to attract an investor for 30 years. Tao said he would think about it and a few days later came to Sri Lanka. Tao, his daughter Mildred and I visited the Wellawatte Spinning and Weaving Mills. It was being used as a football field by street urchins, there were squatters and various nefarious activities were going on – but Tao said he would take it over. Nobody told Tao what to do; he decided. Being the person he is, he said he would build houses for the squatters instead of simply moving them out. Sorting out land matters took almost two years. Since the land was vested in the Treasury, Bank of Ceylon’s Sumi Moonesinghe told the Treasury to give the land to the BoC since the Treasury owed it so much money. Bank of Ceylon then approached us to take over and build and manage it. They kept 40% and we were sold 60% plus total management of the project. The ground-breaking ceremony for Havelock City was on 18 May 2004. It was to be a city within a city – the first of its kind in Sri Lanka. This with a civil war still ongoing with no resolution in sight. This was the vision of S.P. Tao. Q: Could you describe a day in your life today as Deputy Chairman of Overseas Realty? Q: Drawing from your decades of experience, what would you say Sri Lanka needs to get right? A: Sri Lanka needs to worry about the brains that are leaving this country, not just the money. Money can be earned if you have the brains. We have to entice the diaspora to return to get Sri Lanka back on track.